For decades, the Earl’s Court Motor Show was the annual pilgrimage for car dreamers and buyers. Millions jostled to see the latest models, gadgets, showgirls, celebrities, and with any luck grab armfuls of brochures. The Earl’s Court exhibition center is scheduled for demolition, but the love of the show still remains, and the Goodwood Revival, for instance, still has its own Earls Court Motor Show recreation every year. Now the excitement of the show returns with this colorful history, with archive images of British, European, and American cars at their finest, landmark models for each year, heroic failures, and one offs. 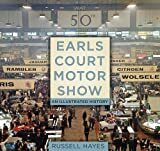 Russell Hayes relives the glory days of the past in this nostalgic celebration of the Earl's Court Motor Show. Russell Hayes is a motoring journalist and has worked for TV programs such as Top Gear, The Car’s the Star, and Driven. He is the author of The Volkswagen Golf Story. He has written Haynes books on Lotus, TVR, and the Ford Cortina, and works as a press officer at the High Court in London. He is an associate member of the Guild of Motoring Writers.